A simple olive oil and lemon dressing works well, seasoned with salt and pepper. Cook our Bacci’s Fresh Potato Gnocchi on plenty of salted water until they rise to the top, then drain well. Next, toast them in a fry pan with olive or coconut oil until deliciously crisp and golden brown. Toss them through a salad with baby spinach, rocket, roast pumpkin, apple slices, feta and walnuts. Dress and season to your liking! 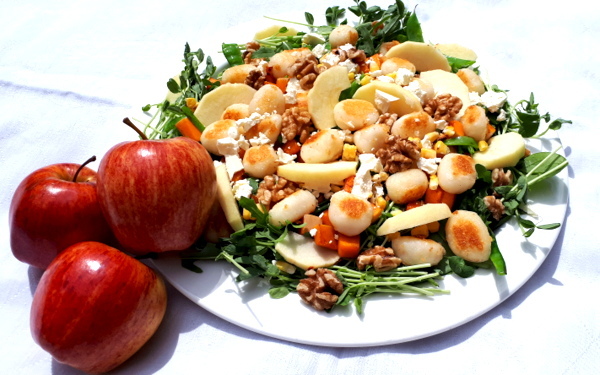 This salad is perfect for late summer or autumn days! We used a butternut pumpkin – no need to peel it! The peel softens when the pumpkin is roasted or browned in a fry pan and adds extra texture to the salad.